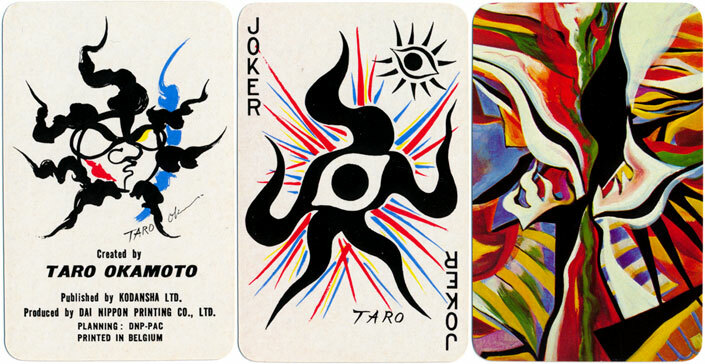 Japanese artist Taro Okamoto (1911-1996) was noted for his abstract and avant-garde paintings and sculpture. 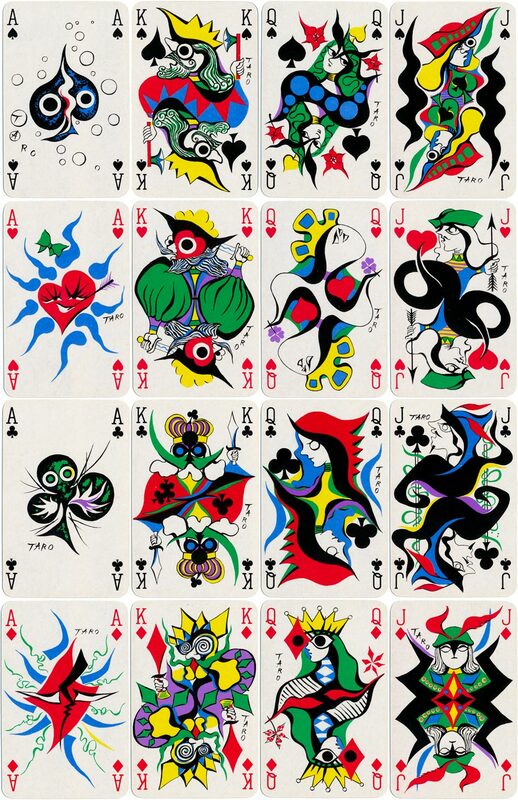 The combination of shapes and colours in these playing cards creates a vibrant and eye-catching surreal effect. One of Okamoto's famous works, Tower of the Sun, became the symbol of Expo '70 in Suita, Osaka, 1970. During the 1970s Okamoto was also working as a muralist and designer whilst continuing to create and exhibit new works. His mural "The Myth of Tomorrow" (2008) depicts a human figure being hit by an atomic bomb. Above: Taro Okamoto playing cards, 1977. 52 cards + 2 Jokers in box. 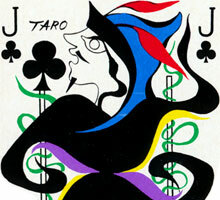 The artist's name 'Taro' appears on all the court cards. Born in Tokyo, Taro Okamoto (1911-1996) was the eldest son of cartoonist Ippei Okamoto and the poet and novelist Kanoko Okamoto. In 1941 he was awarded the Japanese Nika Prize. Okamoto served in the military from 1942-1946, returning to Tokyo to find many of his paintings burned in an air raid. In 1948, he began to explore the integration of avant-garde art and literature. One of Okamoto's famous works, Tower of the Sun, became the symbol of Expo '70 in Suita, Osaka, 1970. On November 17, 2008, his mural "The Myth of Tomorrow", depicting a human figure being hit by an atomic bomb, was unveiled in Tokyo. Illuminated capital 'J' by Kathryn Finter.